Published in the South Kent Gazette, 10 October, 1979. Zion Chapel, which stood at the northern corner of Last Lane, dated from 1703. Previous to that, the site had been occupied by a malt house. Mr Philip Papillon, M.P., purchased the malting premises for the Presbyterians, and they used it as a meeting house without much alteration. In 1708 David Papillon further assisted the congregation to improve the place, but Presbyterians being few in Dover, the congregation became too small to keep up a regular ministry, and the chapel was closed in 1769. It remained closed until 1771, when two preachers of the Countess of Huntingdon’s Connexion, named William Aldridge and Joseph Cook, re-opened it as it was. Owing to its ruinous state and some dissension between the old trustees and the newcomers, no great progress was made for a few years; but in 1782 the chapel was rebuilt, with the exception of the north wall. The ministry was somewhat irregular until 1802, when the Rev W. Mather accepted the pastorate, after which the Congregationalists seem to have continued a growing cause there. The chapel was rebuilt and enlarged by the addition of schoolrooms in 1814, and was later renovated. There was an offshoot of members from it, who built the old Russell Street Chapel in 1838, but both congregations have since been united, and assemble in the Congregational Church near the Maison Dieu. Zion Chapel was afterwards used by the Baptists, who moved there from the old chapel on the Pent side. The building was later used as a cinema, The Queen’s Hall, a leather merchant’s premises and finally, before it was demolished, in the early 1970s, it became an amusement hall. The site is now derelict. On the other side of Last Lane was another establishment of ancient origin, the boot and shoe factory of Messrs Coulthard and Wilson. It is mentioned in old records that a company of artificers who made shoes for the Canons of St Martin’s had their dwellings here, and if that be so, it is an instance, not at all unusual, of a particular trade clinging to a particular spot through many centuries. If, however, the Monastery cordwainers did occupy these premises in Saxon or Norman times, we should not find it easy to trace the ecclesiastical succession down to Robert Low, Quaker and shoemaker, who occupied these premises in 1710. He was of an old Puritan stock, and was himself a member of the Society of Friends, who had their meeting place in St James’s Street. When his body was laid to rest in a little burial place, which used to be sited at the north-west corner of the old "Burlington Hotel," the firm changed to Low and Back. The foreman of the business in the Back period was a Mr Fagg, who ultimately became its proprietor; and in turn his foreman, Mr Wells, also became proprietor. Then came the Coulthards. Mr George Coulthard came into the business by marrying the widow of Wells, and he left the property to his son, Mr Thomas Fagg Coulthard, who, in the first half of the 19th century, had Mr Archibald Wilson as his foreman. Mr Thomas Fagg was easy-going, but Mr Wilson was a man of energy, tact and resource. As foreman he was so indispensable that, in 1860, he became partner, and ultimately sole proprietor. Coulthard and Wilson continued to occupy these premises right up to the outbreak of the second world war. When the building was damaged by enemy action the firm moved to Pencester Road. The Last Lane property was therefore associated, with this one trade for a continuous period of 230 years. The remains of the property were demolished in 1955. The first regular theatre in Dover was in Pierce’s Court, Last Lane, and performances took place there from 1780 till 1790, when a theatre in Snargate Street was erected. Of Dover firms that have been in Last Lane and have moved out, the most notable are Messrs Flashman and Co., Messrs Killick and Back and a popular haunt of “bookworms“ for many years was the bookshop of Charles J. Orme, on the upper Queen Street corner. Messrs Killick occupied the corner opposite Zion Chapel, and Messrs Flashman the premises further south. The old public house called The "Criterion" was formerly the "Oxford Music Hall," and forty years ago it was called “Who’d ’a thought it.“ At the south-east corner of the lane for the great part of the 19th century and during the first quarter of the present century stood a grocer’s established by Mr William Binfield and continued by his son Mr James Binfield. Chapel Lane, now only a footpath, led from Bench Street to what used to be the junction of Chapel Street — which has disappeared under the York Street dual carriageway — with Adrian Street. One hundred and thirty years ago (1840) it was known as Grubbin’s Lane. It changed its name some time after Unitarian Baptist Chapel was built at the upper end of it in the year 1820. While it bore the name of Grubbins, it was a lane dividing the Bench Street back premises on each side of it, the lane itself having only one house, where some time Grubbins had lived. The houses which occupied the two corners at the Bench Street end had an ecclesiastical character. The north-west corner house, now the establishment of Messrs Lukey, Wine merchants, was the Vicarage House of St Mary’s, having been purchased by the parishioners for the use of their minister, the Rev William Byrch, in the year 1754. The house at the other corner of Chapel Lane, in the early part of this century was Mangilli's Cafe Restaurant. It later became a dress shop and was then demolished, along with adjoining properties, for redevelopment in the mid-1970s. Originally it was Priory property, for it was sold by auction by Mr Charles Lamb, in the year 1846, for the remainder of the term of a 500-year lease granted in the year 1660 at a peppercorn rent. The buildings in the rear were then in the same holding, and the tenements on that side further up the lane were built later. The Vicarage House seems to have extended up the lane as far as red brick house, now gone, which, it is presumed, was the Grubbins mansion. Another feature of the lane for many years was a series of stables. 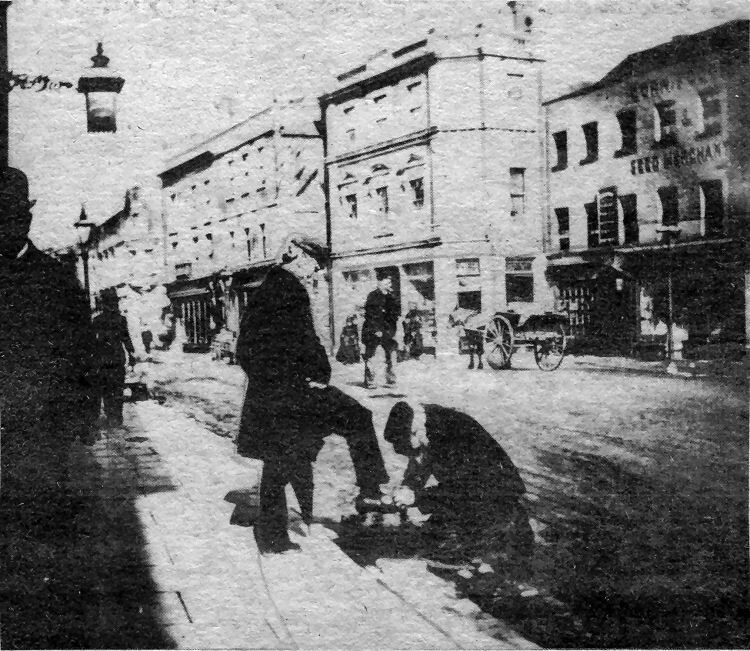 A bearded shoe-shine boy was conveniently at hand when the photographer captured this scene of the early 1890s — before the coming of the Corporation tramway system — looking from King Street, near the old "Fountain Inn", across a corner of the Market Square towards Flashman’s corner and the comer of Castle Street and Church Street. A horse and car stands outside Hogben’s, the corn and seed merchant and in the centre of the picture is the building of Binfield Bros., the wine merchants. The picture is a copy of a very early magic lantern slide, which had been coloured — a process which unfortunately destroyed some fine detail. It is one of a series lent to us by Mr Thomas Bailey (67), of Queen’s Rise, Ringwould, who worked for 39 years at Tilmanstone Colliery.